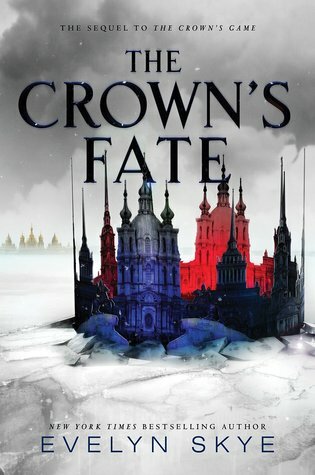 Perfect for fans of Shadow and Bone and Red Queen, The Crown’s Fate is the thrilling sequel to the New York Times bestselling The Crown’s Game, an atmospheric historical fantasy set in Imperial Russia. Russia is on the brink of great change. Pasha’s coronation approaches, and Vika is now the Imperial Enchanter, but the role she once coveted may be more difficult—and dangerous—than she ever expected. Pasha is grappling with his own problems—his legitimacy is in doubt, the girl he loves loathes him, and he believes his best friend is dead. When a challenger to the throne emerges—and with the magic in Russia growing rapidly—Pasha must do whatever it takes to keep his position and protect his kingdom. For Nikolai, the ending of the Crown’s Game stung deeply. Although he just managed to escape death, Nikolai remains alone, a shadow hidden in a not-quite-real world of his own creation. But when he’s given a second chance at life—tied to a dark price—Nikolai must decide just how far he’s willing to go to return to the world. With revolution on the rise, dangerous new magic rearing up, and a tsardom up for the taking, Vika, Nikolai, and Pasha must fight—or face the destruction of not only their world but also themselves. The Crown's Game was one of my absolute favorite books of last year. I have been waiting for a long, long time for this sequel, but when I got it in my hands I was nervous times ten. Will it live up to the expectations I have been building for a year? Will the characters still be the ones that I fell so hard in love with? It actually took me a few days to pick it up and actually start reading. And the minute I started? All those fears and worries melted away. The Crown's Fate was everything I wanted it to be, and more than I could have ever imagined! Since there is still a good while before the release date, I won't give any details away. I don't want to ruin it for y'all, guys! But I can tell you that this sequel was truly amazing. The world got bigger and better, the magic grew. The darkness that lingered in the first book came out swinging in this sequel. There was fighting and death and destruction. My heart broke tens times over throughout the story. My emotions were all over the place, not able to find a place to land even at the end. Nicolai is not the same Nicolai we knew before. The sweet boy whose magic was light and airy. This Nicolai is dark, a shadow of his former self. He is so far removed from who he was in the first book it is almost hard to reconcile that they are one and the same. Pasha grows exponentially, as a man and as a leader. He recognizes his faults and failures, and he was so easy to love. Yuliana also had a much larger presence. And as much as I wanted to smack her sometimes, I adored her. Her love and loyalty to her brother are forces to be reckoned with. And Vika, one of my all time favorite characters. She is extraordinary, even more so than last time. She never, ever gives up on anyone or anything. Pasha is a lucky man to have her by his side, as his Imperial Enchanter... ?! And that is all that I will say. We also have Renata and Ludmilla, back for the second round. I want a Ludmilla in my life! And Renata, I still don't know how I feel about her. She made me angry, but I get her. I really do. Speaking of Ludmilla and Renata, they are where my only complaints come in. With Ludmilla, we just didn't get enough of her. I wanted more of her brightness and laughter, especially in this much darker story. With Renata, I feel like her storyline in this one was a little underdeveloped. I understood the role she was playing, but it felt a little underwhelming, especially at the end. She played a bigger role, but it felt like her role wasn't resolved. I don't know, maybe its just me. So, all of that to say this... Evelyn Skye is one formidable writer. She turns words on a page into something truly magical. I have heard rumors that there may be a third book in the works, and I sure do hope that is true. But even if this was the end of this story, it was one heck of a ride and I am happy I joined it. Seriously though, there is SO MUCH MORE OF THIS WORLD AND THESE CHARACTERS! BRING IT ON! !